Cosmetic eye surgery is often underestimated. Most people who are dissatisfied with the appearance of their eyelids just see the “lid” and only want to have the excess skin of the upper eyelids removed. This measure is not sufficient, unfortunately, in most cases. How does your eye look like? 1.How wide is your upper lid? If it is narrower than 2mm, there could be some excess skin. 2. 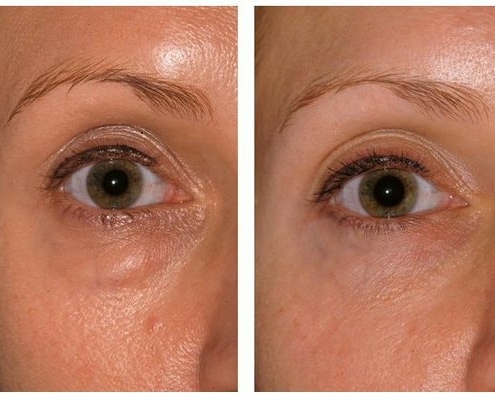 Is the excess skin evenly distributed over the upper eyelid or stronger in the lateral area? When the excess skin is more pronounced in the lateral area, the eyebrows also droop. In this case, besides the removal of excess skin, a lateral raising of the eyebrow should also be considered. 3. Is there excess skin only in the lateral region of the upper lid? In this case, you have what is called, “drooping eyebrows”. To correct you have an eyebrow lift but not remove any skin. 4.Does existing excess skin affect your eyelashes? It may be that “visual field impairment” is present. If this is the case, removal of excess skin is usually paid for by your health insurance company. 5. Some people get, in the course of aging, small deposits in the upper eyelids, which are mostly located on the bridge of the nose; is this also your case? These are small fat deposits surrounding the eye. To eliminate this fold, it can be either turned back or removed surgically. 6. Do you have bags and dark circles under the eyes? Before, only the bags would be removed, which has been considered outdated and inappropriate for some time. Rather, they should use the existing fat in the bags of the eyes to aid in the correction of the existing eye circles. To this end, a so-called “fat flap” is performed. 7. What if you only have bags under the eyes? Bags under the eyes usually occur only at a very young age. In this exceptional case, the removal of excess fat is the usual procedure. 8. What if you only have dark circles? Dark circles can be relatively easily corrected by fat grafting. 9. 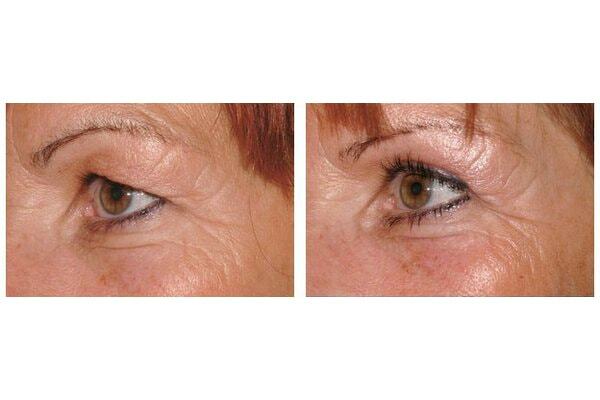 Do you have many wrinkles on the lower eyelids? There may be a surplus of skin on the lower eyelids. Whether this excess skin is removed or more volume (fat grafting) is to be added can only be clarified in a personal conversation with your plastic surgeon. 10. Do you feel that you have a “scowl” without excess skin present on the upper eyelids? If this is the case you could be suffering from drooping eyebrows. A forehead lift can be performed. 11. Do you feel like you have a “sad look” (dachshund eyes)? Check to see if the lateral corner of the eye is lower than the inner. If so, by lifting the “lateral canthus” appearance can be improved. At the consultation, you should make sure that your doctor analyzes all the points and offers the full range of possible procedures. Sadly, much too often excess skin on the upper lid is removed without also raising the lateral eyebrows and the bags under the eyes are not corrected by the Loeb technique. 1. What are drooping eyelids? Excess skin of the upper eyelids. Only very rarely is it the sole cause of unattractive eyelids. 2. When planning a correction, what areas of the outer eye have to be considered? The eye is divided into at least five areas, from an aesthetic and surgical point of view: eyebrows, upper eyelids, lower eyelids, eye bags and dark circles. These five areas must be analyzed and incorporated into the planning. 3. When are the eyebrows considered in the concept of surgical correction? If the eyebrows are just fallen sideways, they can simulate an excess of skin on the upper lids and the sides should be raised. If the eyebrows have fallen over the entire width (“frown”), a complete eyebrow raising should be done (forehead lift) so that the eyebrows are sitting higher again. 4. What happens in an upper eyelid surgery? In principle, the excess skin is removed. Depending on the extent, it may be necessary to remove a little of the underlying muscle as well as some of the fat that has slipped. However, it is often necessary to do a lateral brow lift at the same time. 5. How can lower eyelids be corrected? When lower lid correction is done, great care must be taken. 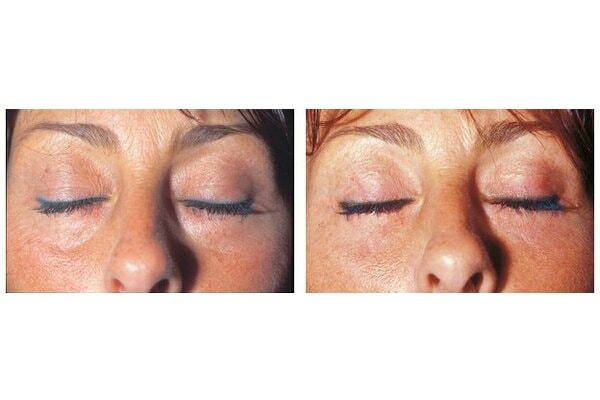 If there is excess skin, it must be removed, similar to the upper eyelids. However, too much skin should not be removed because this can lead to ectropion (a turning out of the eyelid). Often, therefore, Canthopexy should accompany the procedure, thus increasing the lateral canthus. This action stretches the eyelid and may also prevent the formation of ectropion. 6. What are bags under the eyes? The eyeball is surrounded by a padding of fat. These fats are held in position by a thin layer of connective tissue. 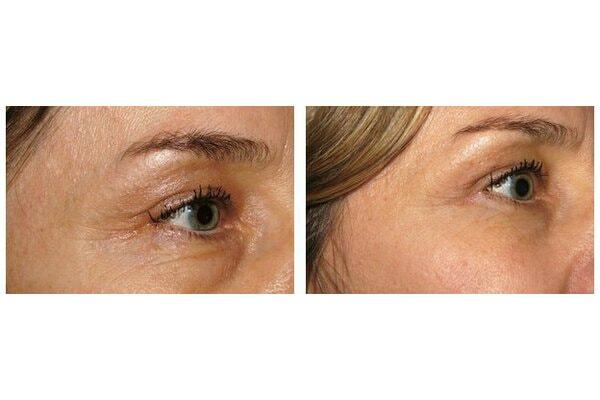 With age, the elasticity and strength of this connective tissue starts to diminish, the fat slips forward, the skin of the lower eyelid starts to arch outward and appear puffy. 7. How can eye bags be corrected? Before, the fat was simply removed. Almost always, this method is unsuitable, as the volume is lost and the eye appears vacant. It is much better to use the fat that is usually present in correction of dark circles for the eye bags. This happens with a fat flap, during which the body fat around the rim of the eye socket is pushed downwards into the region of the eye circles, which are also puffed up and corrected in this way. 8. What are dark circles? By this, we almost always refer to the typical depth of the tissue below the lower eyelid along the bony rim of the eye socket. They are also called all-optical dark circles, which are characterized by a darkening of the skin in the eyelid. 9. How are dark circles corrected? If dark circles are present alone, an autologous fat transplantation is very well suited. 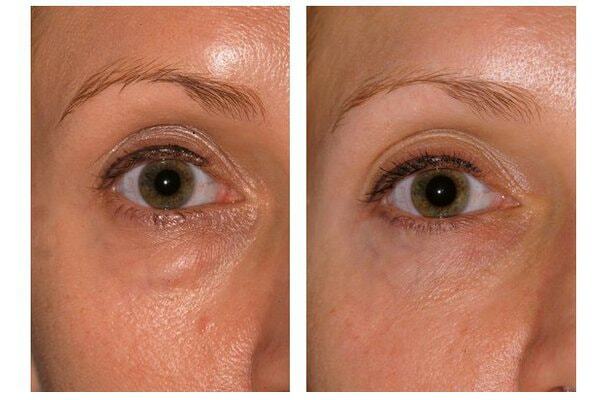 If dark circles and puffy eye bags are present, the best corrective method is the fat flap plasty. 10. Can all five problem areas be corrected at the same time? Basically yes, the procedure would then take about 2.5-3 hours. After such a procedure, one night of inpatient hospital stay is recommended. 11. When does health insurance cover the cost for the procedure? Health insurance covers the cost of an upper eyelid surgery if the surgery is medically indicated. This is the case when the excess skin is so strong on the upper lids that it obstructs the vision (“visual field”) or if there is an age-related ectropion. 12. What is an ectropion? Ectropion refers to the turning-out of the lid. An ectropion is found almost exclusively in the lower eyelids. An ectropion can occur due to age or as a complication of lower eyelid surgery. Ectropion may be corrected surgically. 13. What advantage is there of laser eyelid correction? The only advantage is that the wound would bleed less. On the other hand, the scarring from cutting through the skin with the laser has shown to be more conspicuous. Since with the laser nothing but removal of excess skin is done, it has no influence on the postoperative result. Media reports suggest the use of lasers in eyelid surgery are poorly researched and do mislead the readers. 14. Can eyelid surgery be performed under local anesthesia? Yes, an eyelid surgery is almost always done under local anesthesia, but it can be done for reasons of comfort even under sedation. 15. How long does the surgery last and how long do you stay in the hospital? Depending on what all is done, the surgery takes between 30 minutes and three hours. Almost always, you can leave the hospital a few hours after surgery. When the upper and lower lids are operated together, a hospital stay of one night is recommended. 16. What complications can occur? The most common complications are the consequences of over-correction. If too much skin on the upper eyelid is removed, it cannot be closed, removing too much skin under the lower lid leads to ectropion. Further complications are asymmetry, hypersensitivity, lacrimation increased. Surgical complications can be corrected surgically. 17. After a Blepharoplasty, when can I resume my normal activities? Depending on the extent of surgery, recuperation should last 1-2 weeks. If you purchase the Enzyklopaedia Aesthetica book “Augenlidkorrektur” (Eyelid Surgery) ( EUR 29.90 ) the first consultation is free of charge! You can purchase the book during your first visit in the ordination or order it online. Blood lab and X-ray are no additional costs if you are insured in Austria. The same applies to the OP-release by an internist or general practitioner, who are under contract with the usual social security institutions in Austria. In our medical center, there is an internist that the insurance considers a physician of choice. In this case, the insurance will cover about 50% of the cost. EUR 300 – 1.100 – depending on surgery length and hospital. EUR 700 – 3.500,- depending on the duration of the surgery, number of nights, room type (suite, single, triple) and hospital. In general, the operation takes place under local anesthesia, therefore there are no additional costs. For surgery under general anesthesia costs will be between EUR 300 – 700. The entire program ( eyebrows , upper and lower eyelids , dark circles and puffiness ) costs about EUR 5.500 – EUR 7.000,-. Aspirin, Thromboass and similar anticoagulants should not be taken 14 days before the procedure. If necessary, a transition into heparin can be arranged. Please note that you should not smoke for 10 days after the operation, because nicotine constricts blood vessels and a regular wound healing is thereby compromised. OP-date set (take a vacation, compensatory time or sick leave, arrange for child care if necessary, etc. Discharge from the hospital is usually same day, sometimes staying overnight in the hospital might be necessary. Please do not drive yourself. Take a taxi or let yourself be picked up. 1st Follow-up Visit (about 5-7 days after surgery): Removing a part of the stitches. 2nd Follow-up Visit (approximately 10 days after surgery): Removing the remaining stitches.